Announcement Mother's Day is Sunday, May 12th! 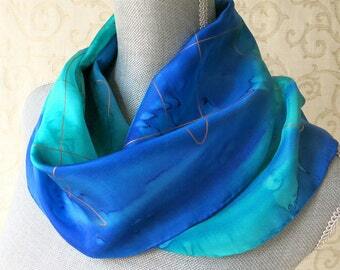 Ocean Avenue Silk's scarves make a wonderful gift! 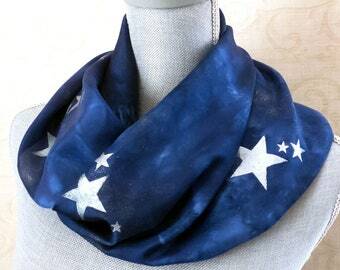 Every scarf is gift packaged and ready to ship (usually within 24 hours). 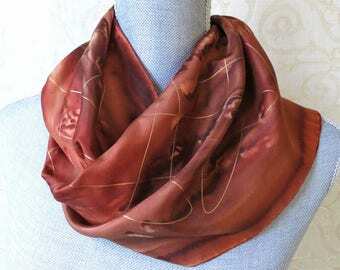 Scarves can be shipped directly to the gift recipient. Add your special message on a gift tag at no extra charge. Just include your message when checking out. Thank you for visiting Ocean Avenue Silks!! 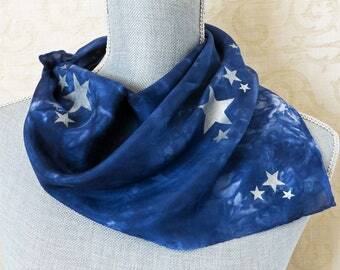 The scarf is absolutely Beautiful...a conversation piece!! Even the packaging makes a statement...a real professional!! Fall Boutique....it was so wonderful to meet customers in person and to get to know local artists! My favorite day! Dye delivery from France!! My niece, Elsa and my cat, Mariah enjoying themselves in my work space! 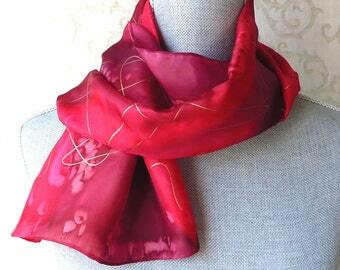 Silk and Color. Affordable Luxury. 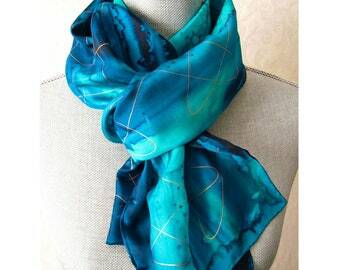 Ocean Avenue Silks http://www.etsy.com/shop/OceanAvenueSilks was born from my love for color and my love of silk painting. After years of working for others, I am very grateful to have the opportunity to work from home. Living in Southern California, I am able to paint outside almost all year round. I do have to deal with rain and wind, cats and kids, bugs and birds and occasionally a request for dinner from my husband! 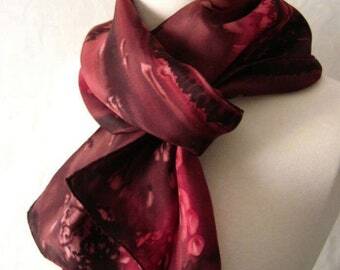 My scarves are created using steam set dyes from France. After painting the dye on each scarf, I will steam set them for at least 4 hours. Steam set dyes create the most vibrant colors possible, and because the dye becomes chemically bonded to the silk fibers during the steaming process, the fabric retains its natural silky feel. 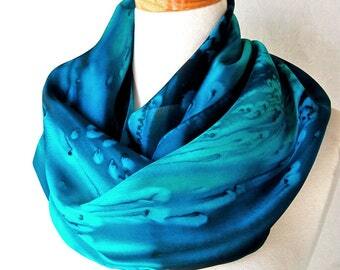 Being a shop owner on Etsy gives me the opportunity to not only do what I love, but also to interact with my customers and get to know the people who wear my scarves. I hope I can always provide them with the best service and a wonderful shopping experience. Thank you for visiting Ocean Avenue Silks! Artist, painter, lover of color! All scarves are guaranteed by me. If there is a problem, please contact me for an exchange or refund. I accept Etsy Payments and Paypal. NOTE: California Residents, there will be a 7.75% sales tax charge when you check out. 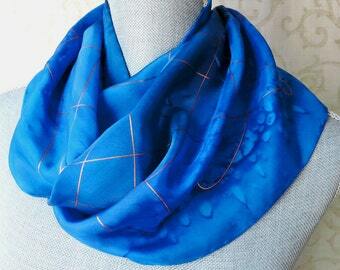 All scarves listed in my shop are in stock and ready to ship, usually within one business day. If you are giving as a gift, I can ship directly to the recipient. I do not include invoices or pricing info in my packages. US DOMESTIC SHIPPING: I ship with USPS and offer first class, Priority, or Express mail which you can select when checking out. INTERNATIONAL SHIPPING: I ship international packages with USPS First Class International. Delivery times vary depending on destination country, but the majority of packages will arrive in 2 to 3 weeks. Please note that while international tracking service is improving in many countries, I may be unable to track your package once it leaves the United States. Any customs fees, taxes, tariffs, duties, etc. that may be incurred at the time of delivery would be at the discretion of your country's tax regulations and are payable by the buyer. While packages generally arrive much sooner, I allow the postal service 5-6 weeks for International delivery before re-sending/refunding for non-delivery. All the disclaimers aside, I have had very few problems with international shipping and will do my best to find your package if it is delayed. Invoices or Pricing Info in Package? 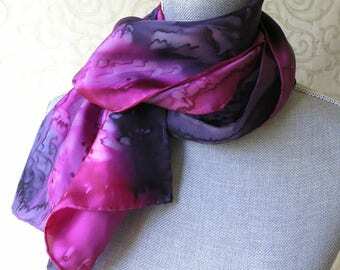 Many of my scarves are sent as gifts so I DO NOT include any invoices or pricing info in my packages (unless requested). The one exception is that when shipping outside the US, the price will show on the customs label. ~My standard sized scarves are approximately 11" x 60". 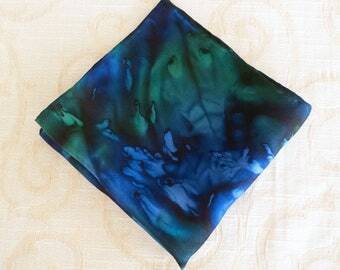 ~The bandanas are approximately 21.5" x 21.5"
All of my scarves come gift packaged, as shown in the last picture of the listing. I can also add a gift tag with your personal message, just add your message when you check out. All of my scarves are hand washable. Please use a mild detergent (or baby shampoo!) and a touch of fabric softener and iron while damp. I do not recommend Woolite.